The term "xtreme" is often used in sports to indicate feats that go beyond the ordinary. 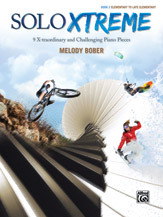 The pieces in the Solo Xtreme series were written to encourage piano students to achieve similar feats. Pieces in this series move beyond single-line melodies that stay in one location, challenging students instead to move around the keyboard, cross hand-over-hand, use a variety of articulations, play harmonic intervals and accidentals, and use the pedal to create color and moods. At the same time, they expand technique and musicianship. Titles: Bike Trek * Evening Sail * Goosebump Boogie * Holiday Bells * La Celebracion * Night Whispers * Stealth Mode * Steps to a Mystery * Taco Time!